Kick Drops over a minute off his mile seed time and Ryan is over 20 seconds faster too! 100% improvement over seed time in the 100 free with 6 out of 8 smashing their previous lifetime bests. 2 Lifetime bests in the 200 Breast, and a 5 second drop in the 200 Fly. Then we get to two of the most magical relays of my career... our A and B 400 Free Relay. The B relay kicked things off by all going their best splits - and clocking in only 1 second off our school record! Peem's lead off leg was inspirational, especially after spraining his foot on day one of the meet. Two seniors then swam their best 100 frees to date, and Lipoff swims the first 47 of his career. Our A relay, all pumped up now, starts with a lone senior among 3 freshman. Mr. Berry has had a good meet, but he still has one more message to send - and he does it by breaking the school record in the 100 free with his lead off leg. 47.5, not too shabby for a backstroker. From their we catch fire with Depew splitting 46.4, Aupi going 47.4, and Ned anchoring with a 46.7. All in all we smash the previous 3:13 record with a 3:08 - placing 6th overall, and get this, only .5 seconds off of Williams. Cool, huh? More recaps to come, but my to do list is a mile long... so here are some quick numbers. 24 New College Records in total this year. Incredible.....say, gonna post pics of the new "do" ? Great performances guys! Us alumni watched the results come in and were really excited to see you all performing at such a high level. 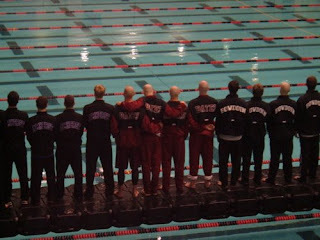 With the kind of swims you had this weekend Bates Swimming and Diving has a lot to look forward to. The excitement was in the air. The 500 fans crammed into 300 seats cheered in ear splitting fashion after each event. The Bates Men showed you don't have to be the largest team to have the biggest heart. Go Bobcats.